Get the most complete information of your computer. Sometimes when we want to upgrade the hardware on our equipment we wonder about what we have installed right now to make sure that the new components we purchase be compatible with our other components. Or maybe, we are about to install a game or software and we don't know if its going to be compatible with our system. This is basically where Everest Home edition saves the day. It gives you a thorough list of the components currently installed each one with the manufacturer details along with driver information. Its important to notice that this software is not compatible with windows vista or 7, still, this is one of the most downloades softwares that you can find in the web, and best of all, for free. 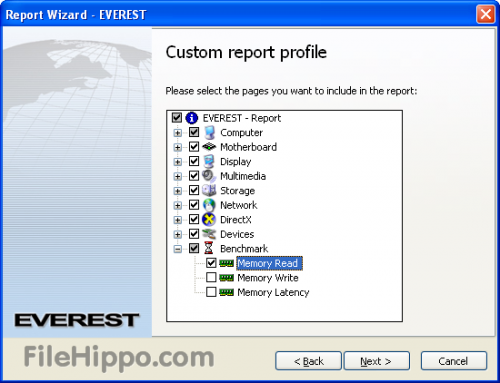 Investigate your system in depth with Everest Home Edition Free. Download it now from our servers, fast and secure. Downloads Software informs that Everest Home Edition 2.20.405 should be only used in accordance with the rules of intellectual property and the existing Criminal Code. The inclusion of any keygen, serial or crack is not allowed and disclaims any liability for the inappropriate use of this software.